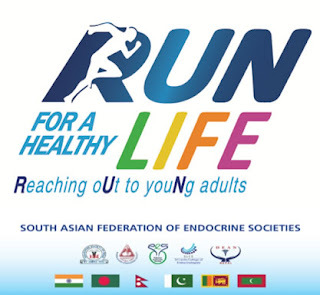 Joining forces with the collective aim of raising awareness of obesity and promoting a healthier youth in the South Asian region and beyond, ISE member societies from Bangladesh, India, Nepal, Pakistan, and Sri Lanka have come together under their Regional Federation, the South Asian Federation of Endocrine Societies (SAFES), to launch the “Run for a Health Life” campaign to create awareness of obesity, one of the most rapidly increasing risk factors of diabetes and other serious diseases. The campaign aims to prevent the prevalence of obesity by reaching out to schools and broadly to the younger generation by conducting awareness sessions on changing lifestyles and encourages greater physical activity, especially running. 1. Addressing the rising trend of obesity in young children – Pakistan alone is the 8th most obese country in the world! The campaign officially launched on 4th May with the support of regional government and international health ambassadors.